Young children have always been among the most vulnerable members of society, and yet they have not always been regarded as such. 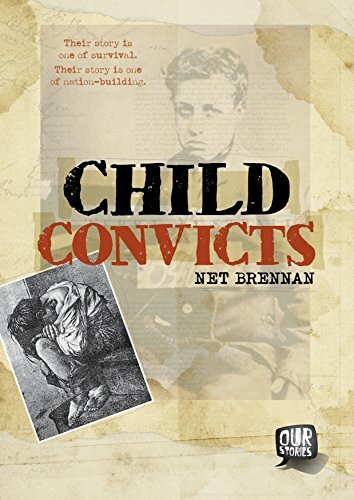 In a new historical picture book by Net Brennan, ominously titled Child Convicts, 17th century British children who were caught breaking the law (usually because they had no choice) were tried and convicted as adults and sentenced to horrendous punishments. Brennan’s prose is fast-paced and in-your-face as she enlightens readers on the shocking history behind the living conditions in early British history, when filth, famine and disease transformed many children into orphans. Young children (some as young as four) could be put to work just like adults and for the same number of hours cleaning chimneys or working in mines. Because of their size, many were forced to succumb to the will of devious adults who put them to work committing lightweight crimes like picking pockets, stealing clothes, or breaking into homes. These crimes led to floggings, hangings, or being shipped off to the isolated and untried colonies of Australia to work in penal colonies—after they built the colonies, that is. Readers learn of the tragic plights of ’tweens and teens who had no choice except to join gangs to survive; children who were stripped naked, scrubbed raw, shackled, and given a number to replace their names just before being transported to serve their sentences; children who ran away repeatedly, only to be beaten and brought back; and children who were too sick to work but were beaten because jailors thought they were faking. This is an informative book about an important (albeit, virtually unknown) time in world history, and it comes complete with old maps and even older illustrations that are sure to keep readers engaged. Still, teachers and parents alike should be forewarned that the storyline, by necessity, is quite dark. There are tales of floggings, hangings, leg irons, starvation, and poor, confused children weeping and weeping for their parents. There is, however, at least one redeeming story about a 10 year old girl named Mary, convicted of attacking an eight year old and breaking her drink bottle, who was shipped to the penal colony and ended up bearing 21 children over her lifetime. When she died at age 82, she had over 300 descendants, one of whom had served as a prime minister. This book originally targets the middle grades, ages 8 to 12; however, it is also recommended for middle school and high school classrooms studying history, crime and punishment, labor laws, and other civic concepts.